The history of of the city of Chicago is one of massive investment in industrial, social, and architectural innovations. Yet, as is obvious to anyone who knows a bit about the town, the returns on these investments are not, and never have been, fairly allocated throughout all segments of society. Alongside, or perhaps in spite of, the city’s achievements, the history of Chicago is fraught with systemic racism and inequality that has engendered a deep-rooted distrust of its social and political institutions among its minority populations–a term which is itself a misnomer, really, as a quick look at the data on Chicago from the census bureau reveals that these minority populations comprise more than half of the total population. It is no wonder, then, that when in 2013 Mayor Rahm Emanuel announced an unprecedented wave of school closings located mostly on the city’s heavily black and Latino south and west sides, the plan was met with a roar of protest from parents, students, and teachers. The Emmanuel administration pitched the closings as a solution to a budget problem, a response to declining enrollments, and a chance to purge bad schools that were dragging down the whole system. Years later, have these communities seen any of the promised benefits of this purge from within the city’s secondary educational system? Unflinchingly wading into the middle of this controversy, Chicago native, former CPS teacher, poet, and now associate professor at the University of Chicago’s School of Social Service Administration Eve L. Ewing delves into this issue deeper than anyone has done before in her forthcoming book Ghosts in the Schoolyard: Racism and School Closings on Chicago’s South Side. Rooting her exploration in the historic African American neighborhood of Bronzeville, Ewing reveals that this issue is about much more than just schools. 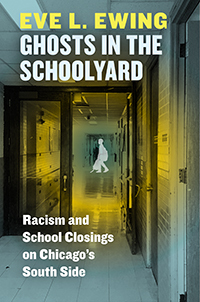 Black communities see the closing of their schools—schools that are certainly less than perfect but that are theirs—as one more in a long line of racist policies. The fight to keep them open is yet another front in the ongoing struggle of black people in America to build successful lives and achieve true self-determination. Two questions permeate this study: ‘If the schools were so terrible, why did people fight for them so adamantly?’ and ‘What role did race, power, and history play in what was happening in my hometown?’ . . . The deeply moving final chapter addresses the Bronzeville community’s sense of mourning in the loss of ‘institutions, like our schools that have helped shape our sense of who we are.’ Ewing’s work, a tribute to students, parents, teachers, and community members, is essential for general readers confronting the issues of ‘school choice’ and school funding, as well as useful for historians of the African-American experience. And it’s not just a local issue. Like Matthew Desmond’s work in the book Evicted, which told the story of evictions in Milwaukee in a way that helped readers understand how the same problems plagued people in their own cities, Ewing’s tale of Chicago schools will strike familiar chords with anyone involved with American urban schools. You don’t have to wait until October to experience Ewing’s provocative and insightful writing. Her website offers links to at least a couple of years worth of poetry and essays exploring Chicago’s social and historical fabric. You can also follow her immensely popular Twitter feed–or check out her work in person at a reading this Saturday at the Chicago Poetry Block Party at Austin Town Hall on Lake Street. One way or another, we promise you’ll be hearing a lot about Eve Ewing this fall.